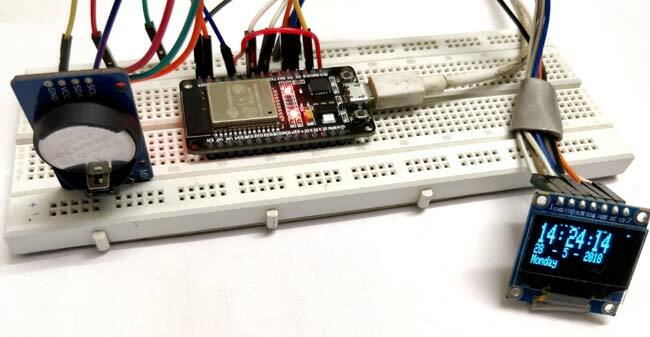 We will use DS3231 RTC module to keep track of the correct time and display it on SPI OLED by using ESP32 as our microcontroller. ESP32 is more than a microcontroller. It has Wi-Fi and Bluetooth chip inside it and 39 GPIO pins. It supports all communication protocols like SPI, I2C, UART, etc. If you are new to ESP32 then first go through our Getting started with ESP32 tutorial. DS3231 is a RTC (Real Time Clock) module. It is used to maintain the date and time for most of the Electronics projects. This module has its own coin cell power supply using which it maintains the date and time even when the main power is removed or the MCU has gone through a hard reset. So once we set the date and time in this module it will keep track of it always. There are several types of RTC ICs available like DS1307, DS3231 etc. Note: When using this module for the first time you have to set the date and time. You can also use RTC IC DS1307, we have previously used DS1307 with Arduino. The term OLED stands for “Organic Light emitting diode” it uses the same technology that is used in most of our televisions but has fewer pixels compared to them. It is real fun to have these cool looking display modules since it will make our projects look cool. We have covered a full Article on OLED displays and its types here. We have also interfaced OLED with Raspberry pi and with Arduino. Complete code for ESP32 is given at the end of the article. Here we are explaining few important parts of code. Then define all the pins of OLED. You don't need to define pins for RTC module because these pins are already defined in WIRE library. In setup function, we will call a function rtc.adjust(DateTime(__DATE__, __TIME__)) which will set the time according to our PC time. After that we call display functions to show on OLED. Then finally in loop function, we will store our time in DateTime now pre-defined variable and display the time using display functions like setTextSize, setCursor, etc. Set these according to your need and use display.println function to show on OLED. So this is how you can display time on OLED using ESP32 and as you know ESP is known for its IoT capabilities, so you can use this to publish the time on internet. In next article we will show you to display Internet Time on ESP without using any RTC Module. the esp32 has an inbuilt RTC, so why would you want to use an external one?